Mr Amidu Chinnia Issahaku, the Acting Upper West Regional Minister, has expressed government's commitment to create a just society where fair opportunities for all Ghanaians are ensured regardless of their location. 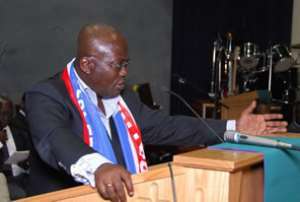 He said Akuffo-Addo's administration believes in working to create fair and inclusive society where equality of opportunity is guaranteed and citizens are permitted to share in the prosperity of the nation. He was addressing a two-day capacity building workshop for District Coordinating Directors, Planning Officers and Gender Desk Officers on strategic implementation of Ghana's Gender Policy. The workshop was organized by the Department of Gender with funding support from the Mennonite Economic Development Associates. The Minister said the objective of building a fair society would be achieved through the creation of a well-funded and proper functioning welfare system which addresses the needs of the weak, marginalized, vulnerable and socially excluded in society. Government would pursue the welfare of women and children, he said, through the introduction of an Integrated Social Service Programme for children, families and vulnerable adults to consolidate the relevant health, education and justice systems as well as all social protection programmes. Government's efforts aimed at promoting gender issues are evident in the enactment of laws, development policies, strategies and commitments to international instruments that safeguard and promote the development of women, men, boys and girls. Mr Issahaku said effective planning would among others seek to bridge development gaps among communities. There is the need, he said, for the Medium Term Development Plans (MTDPs) of the Metropolitan, Municipal and District Assemblies (MMDAs) to create a favourable environment for the under privileged. Madam Charity Batuure, the Acting Upper West Regional Director of Department of Gender, said globally, the most effective tool for development was the empowerment of women. 'But sadly we often omit their roles in planning and overlook their contributions to development', she said. She said the focus on mainstreaming as depicted in the theme of the workshop would allow for high level integration as well as specific guidelines as to how the issues of women, men, boys and girls would receive treatment. 'Thus the social, legal, civic, political economic and cultural conditions of the people would be improved in an appreciable manner and as required by national and international frameworks', she said.